Where damage to a person's teeth is extreme and may be beyond repair, we can use porcelain or porcelain pasted on gold crowns to make the smile appear like new. This is an extremely reliable technique for repairing the most severe of dental problems, even permanently replacing missing teeth to offer a complete smile and a functional bite. We are renowned for the quality of our work and the fantastic changes we make for people using this technology. These treatments are used for a long lasting correction of major dental problems. It is usual for these treatments to last for 20 to 30 years, which is as close to permanent as dental treatment can get. • Offers support to misshapen teeth or broken teeth. • Repairs smile and functional chewing problems. Crown and bridgework are a very reliable solutions for major dental problems caused by accidents, diseases, or wear and tear. Major problems can usually be corrected using these techniques. Materials used in these repairs are either high-grade porcelain or porcelain bonded to gold. A higher strength of the porcelain and gold materials is recommended to treat the most serious dental problems. In instances where damage has occurred resulting in the loss of teeth, where teeth have broken away through excessive wear, or tooth damage caused by old fillings breaking down, crowns and/or bridges can be used as a long-term solution. In order to ensure the maximum level of comfort, some patients require minor oral surgical procedures before receiving a partial or complete denture, A denture sits on the bone ridge, so it is very important that the bone be the proper shape and size. If a tooth needs to be extracted, the underlying bone might be left sharp and uneven. For the best fit of a denture, the bone might need to be smoothed out or reshaped. 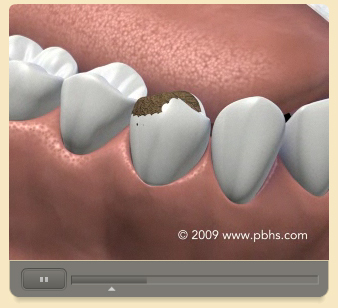 Occasionally, excess bone would need to be removed prior to denture insertion. • Bone smoothing and reshaping. • Removal of excess bone. • Removal of excess gum tissue. • Exposure of impacted teeth.